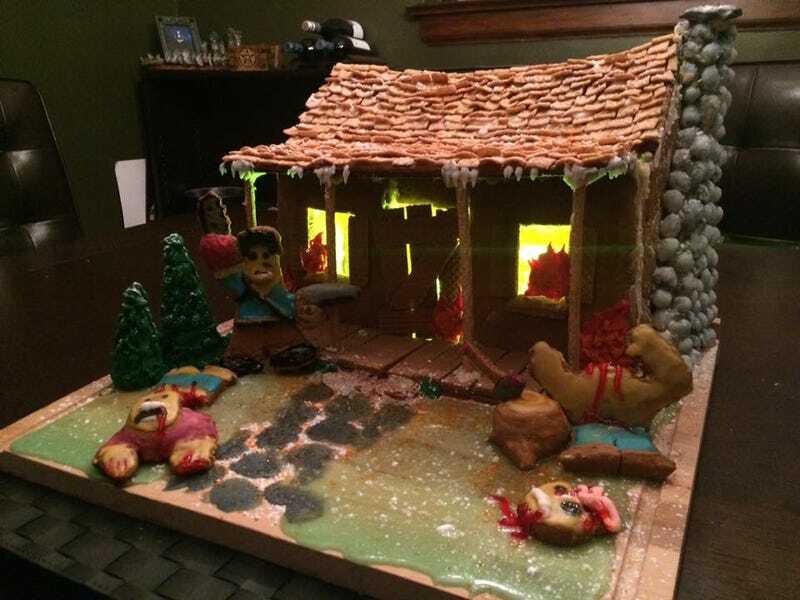 Huge props to io9 readers Johnny Larocque and Nicole Cooper, who crafted this adorably spooky yet undeniably festive gingerbread house inspired by the TV show Ash vs Evil Dead and the Evil Dead movies. Ash vs Gingerdead? Check out more photos below! Cooper gets the cabin’s porch just right, complete with chocolate wafers serving as planks and shutters. The attention to detail in the scene is just insane. That chimney “smoke” is actually a cleverly repurposed marshmallow. Of course, no Evil Dead tableaux would be complete without a Deadite or two! Side-angle shot of the finished product, complete with eerie lighting and a Deadite who seems to have lost its head. See all the photos of Cooper and Larocque’s construction process in their Facebook album!